Alien on Toast: Warning - crap food maybe closer than it appears! Two weeks of venue catering and hotel/local pub food and I really cannot put into words how glad I am to be home (although I’d be lying if I said that was the only reason I was glad to be home!). The hotel food was the usual crap, pasta & tomato based sauce, cheeseless pizzas yada yada yada... but there was one good Chinese meal and that was about it. The venue catering on the other was dire. The first day I got lucky! The veggie option was a really delicious morrocan veggie tagine with squash and sweet potato and cous cous. The next day, the veggie option was some cheese infested cholesterol-fest, but I could eat salad, potatoes and rice. Day 3 however, it became apparent that the course co-ordinator had not passed on my dietary requirements to the caterer and I was stuck with dry bread and cucumber. I didn’t sit there and complain to everyone though – unlike the insufferable asshat, with the ridiculous eyebrows, that whinged on and on and on about how much he hates fish, for pretty much the rest of that day! What a tool. So anyway the next day I was told they were now aware of my ‘special diet’ and the waitress asked me if I would eat plain chicken?? Hmm, is it vegan if it’s plain – that’s news to me! So I politely said no and got a lunch of soggy veggies and dry new potatoes, instead. After that, the food ranged from just about edible to damn right shite. Examples are the mushroom stew veggie option thing, but without the cream & tarragon sauce (so that’s plain mushrooms then), a sweet potato with sun-dried tomatoes and mushrooms on top, that was still hard in the middle, the most disgusting stir-fry in the world which consisted of courgette (PUKE), broccoli and chewy cabbage doused in a little soy sauce (and that was IT aside from some dry bread!) and an incinerated aubergine with flavourless veggie mush on top. 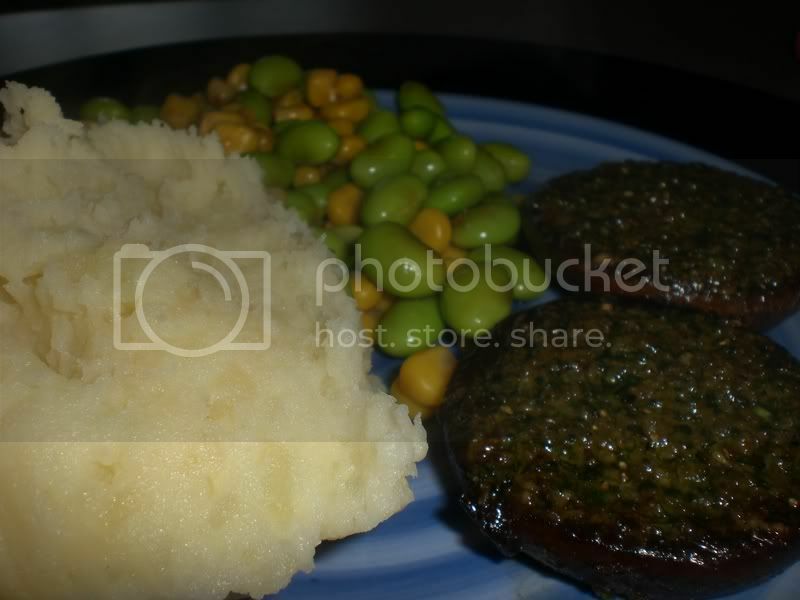 So I got back home yesterday and I’m so freaking glad and to celebrate I cooked up some portobellos with home-made pesto on top and grilled, with mashed potato and VCON corn & edamame salad (well almost, I forgot what was in it and was way to lazy to get the book out so it was my take on it). On to today and to prove remind myself that it’s easy to make something vegan and delicious I’m posting the directions. Hey maybe I’ll direct them to this post when I email them to tell them how easy it really is to cook good vegan food!! 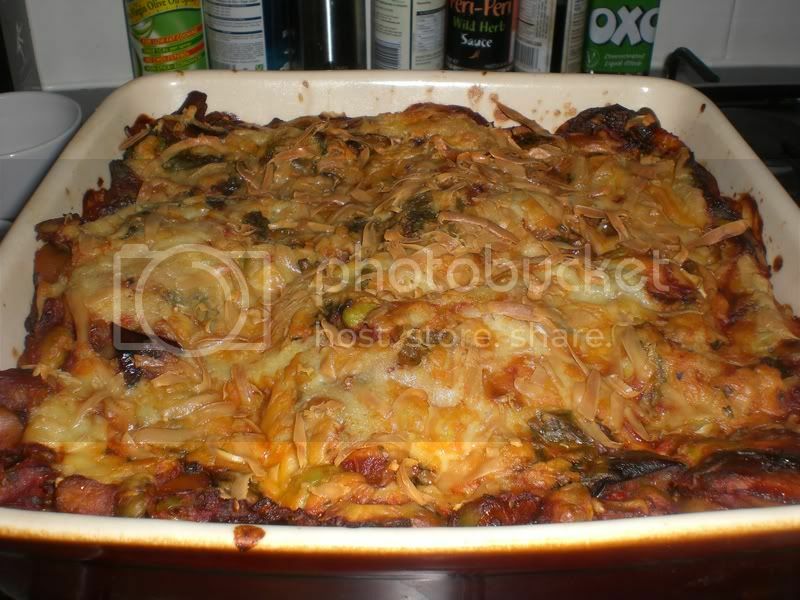 Vegan Lasagne – the ingredients are approximate because I didn’t really measure anything. I used ½ a green pepper, ½ a yellow pepper, 1 small onion, around ½ cup edamame beans defrosted, 1 large mushroom, ½ a pack of spinach, ½ large aubergine. – all diced to around the same size. Mix together all the tomato sauce ingredients (except salt & pepper) and stir well. Over a medium heat, bring up to a low bubble and then turn off the heat. Sauté the onion in a little olive oil for a few minutes, then add the rest of the veggies (except edamame and spinanch) and cook for around 5 minutes. Add the spinach and cook till wilted, then add the edamame and the tomato sauce. Stir well and test for seasoning. Heat the soymilk over a low heat but don’t let it boil. Then make the white sauce by melting the margarine on a low heat (make sure you use a pan you can use a metal whisk in). Stir in the flour and whisk well with a small whisk. Cook for a minute or so then add a little bit of the warm soymilk and mix gently till incorporated. Repeat this process until all the soymilk is incorporated (you’ll need to use a bit of elbow grease!!) and the sauce is smooth and thickened. Add the rest of the ingredients, mix well and take off the heat. I used a 9.5 x 9.5 in lasagne dish for this, any bigger, you’ll need to increase your quantities! 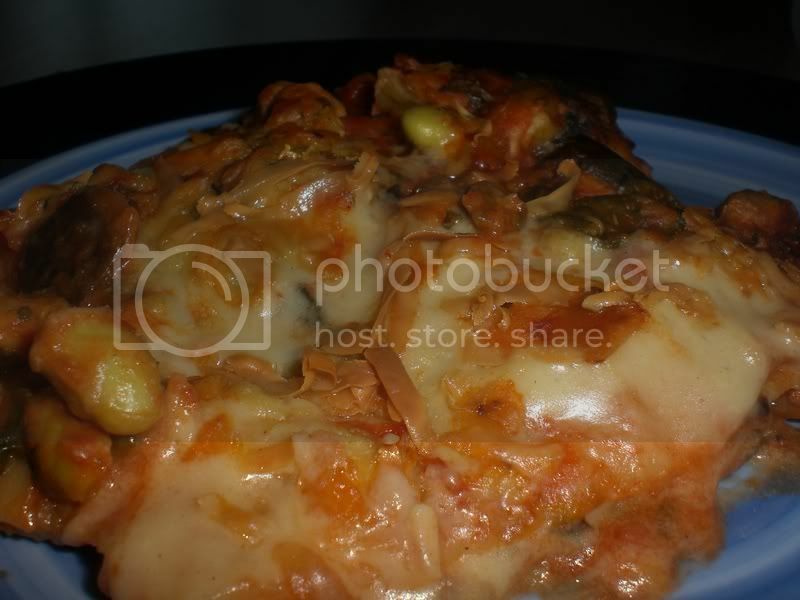 To assemble, line the dish with a layer of lasagne sheets (2½ ) covered mine. Then add a third of the veggie mixture and spread it over well, then a third of the white sauce and spread around. Repeat this process 2 more times and spread the top layer of white sauce well over the top. If using, grate some vegan cheese over the top (I used smoked cheddar sheese!) and then bake, uncovered, for 50 minutes. It could not be easier, it could try – but it would fail! 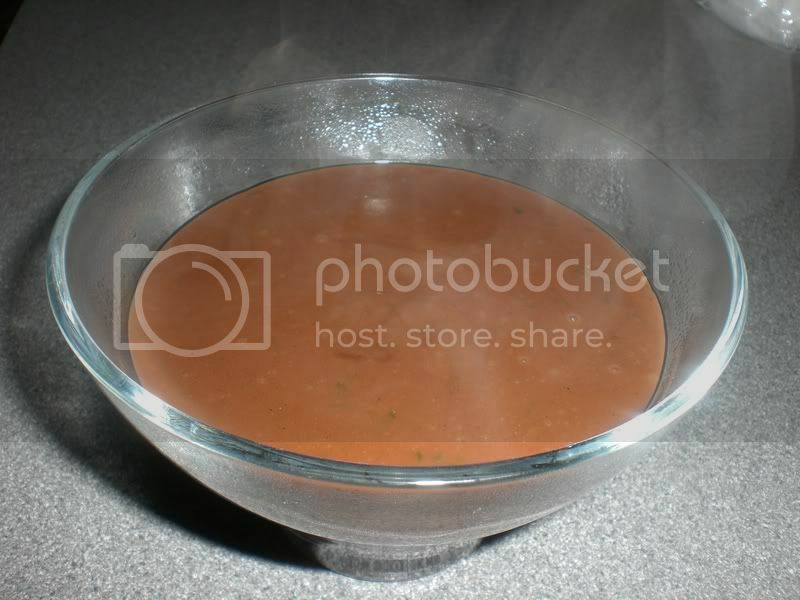 Mix all ingredients together in a saucepan and mix until the arrowroot is dissolved. Stir constantly, over a low heat, until the chocolate chips have fully melted and incorporated and the pudding reaches the desired thickness. This usually takes around 4 or 5 minutes and just as the mixture is about to come to boiling point, it’s done. Serve immediately. If you want to leave it to cool or make double and leave some, you need to cover it straight away (with parchment paper or in an airtight container) to stop a really gross looking skin forming. Although it’s no biggy if this forms – just mix the bugger back into the pudding. Yummy, light, tasty and chocolatey and the lime provides enough zing to stop this being sickly! Tomorrow I have big plans for dinner and recipes!! Watch this space to check if it all works out!! 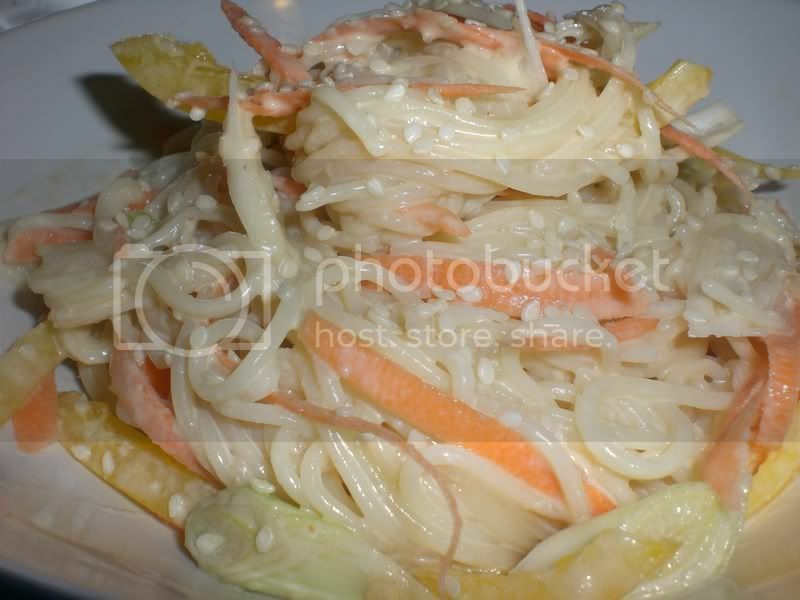 Oh and a bonus pic – today’s lunch, cold sesame noodles. YUM! I kept getting the same sort of questions from omnis this week - oh don't you miss cheese / chocolate / chicken .... not with food like this I don't. They can take their squidgy aubergine and cholesterol laden puddings and shove em up their a-holes! Oooh I want lasagna now.. Sorry you had to eat crap food, but your homemade lasagna looks good enough to make up for all that suffering! dry bread & cucumber?! WTF is wrong with those people! sheeeesh! that stinks, Sal! glad you made up for all that awfulness you had to eat with all of these rock'n dishes! your lasagna looks amazing, and sesame noodles - DIVINE! wow - i can't believe you had to eat all that crap food! but that's awesome that you didn't complain! that's too funny on being asked if you miss all the things that omnis say "i could never give up!" - i can't say i miss any animal product - vegan food is so awesome, especially when it's like the great eats you're creating! mmmmmmmm! After reading the story on the PPK about the poor girl who had to eat tofu blended with water at a wedding - I feel that I was lucky! !